MADERA, CALIFORNIA (March 3, 2017) – RPM Mortgage, Inc. and the Madera Speedway have finalized a multi-year sponsorship agreement that will see them become the title sponsor of the televised RPM Mortgage Pro Late Model Series. RPM Mortgage, based in Alamo, California, is a professional and experienced independent mortgage lender with deep roots in its community. Over the past several years, the company has worked hard to establish itself as an industry leader. Those same values apply to the fast-growing Madera Speedway and its Pro Late Model division. 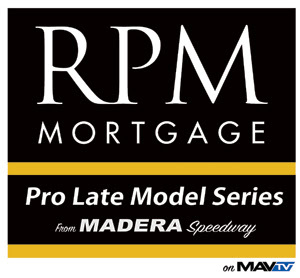 The RPM Mortgage Pro Late Model Series competes in eight MAVTV-televised races, once per month, at the one-third mile Madera Speedway located on the Madera Fairgrounds in Madera, CA. Each event is televised for a one hour tape-delayed episode. This will mark the third season of televised action for the stock car series that averaged nearly 25 entries per event in 2016. March 11th will be the season opening race with $5,000 on the line for the race winner. Additional races include April 29, May 20, June 17, the $5,000 to win Summer Speed Fest on July 29, August 26, and September 23. The season concludes for the RPM Pro Late Model Series with the 5th annual RPM Mortgage Short Track Shootout on October 7. The event is 150 laps and pays $10,000 to win while also crowning the $5,000 division champion. “I feel that we have changed the complexion of racing in many ways with our innovative race programs and our television show, and we are very excited to take these programs to the next level ," Madera Speedway promoter Kenny Shepherd said. "This marketing relationship with RPM Mortgage expands everything we have been working on and provides a tremendous platform for our race teams to showcase their talent for race fans in 2017." In addition to sponsoring the Pro Late Model Series, RPM Mortgage will also continue as primary sponsor for Anthony Guiamano competing in Madera's groundbreaking Jr. Late Model Series as well. For more information on the RPM Mortgage Pro Late Model Series and Madera Speedway, visit RaceMadera.com or follow them on Facebook. Madera Speedway is located on the Madera Fairgrounds on Cleveland Ave and 99. Based in Alamo, Calif., RPM Mortgage (NMLS #9472) is a private mortgage lender dedicated to providing clients with competitive rates, the best customer-focused products, accelerated closings and the highest quality service. RPM’s top executives hold a mortgage-focused track record dating back to 1986 and in 2016, RPM’s agility helped fund $6.6 billion in volume. This momentum has led to RPM being the only privately owned U.S. mortgage originator to have earned Standard & Poor’s (S&P) Above Average ranking in all ratings categories. For more information, please visit www.rpm-mtg.com, call 925.295.9300 or follow @RPMMortgage. Thanks for the opportunity to ‘tell a bit of history’ concerning me, FLUIDYNE and the Collins family. My first racing experiences began at my local track, Saugus Speedway in the mid-70’s where I participated in their Street-Stocks and Figure 8 Divisions. I enjoyed some success on that flat 1/3rd mile… setting a few track records in both classes and was lucky enough to win about 15 main event wins before moving up to their new Sportsman [2-Barrel stock-front-clip class] in 1979. After three seasons there, which also produced a few more wins and track records as well as a couple 2nd place finishes in their yearly Points Championship, I had a chance to move up to the Modified Division and raced at Saugus and Mesa Marin Raceway in 1980 and 1981. I took a hiatus away from racing for a few years starting in 1983, but returned to Mesa Marin to compete in their new Sportsman class in 1986… and was fortunate to win the Championship title in 1987 earning a Trophy and Silver Platter which are still proudly displayed in my office today. Racing at Mesa Marin was a huge step-up! The speed, the competition and the longer races added up to a serious commitment and my team and I poured everything we had into becoming competitive on that 1/2 mile! Thanks to the Collins family and the family-oriented style of racing they provided each weekend, we made many new friends in and around Bakersfield and met a lot of Racers we are still connected with today. You meet a lot of people in racing and I found that those relationships from my 10-11 years in competition have lasted many years after the racing was done. Thanks to Face Book and Twitter, I am able to stay in touch with many of my old teammates, competitors, friends and even some fans. Most of those friendships are ‘frozen in time’… meaning I can bump into one of my racing friends at a track or on social media and within minutes, we are back-in-the-day and talking as though it had not been years between conversations. Needless to say, I am proud of being a ‘Racer’ and have enjoyed being able to stay within the Racing Circles for the last 40 years. It will be great fun to be working with members of the Collins family again as we ‘re-connect’ to our western roots and become a Contingency Partner with the SPEARS Southwest Tour Series. FLUIDYNE High Performance is a proud sponsor of the 2017 SPEARS Southwest Tour Series championship. For more information, go to www.Fluidyne.com or www.srlsouthwesttour.com. Bakersfield, CA – The SPEARS Southwest Tour Series will open its seventeenth season in a big way with the “SPEARS Manufacturing 100”at Irwindale Speedway on Saturday, March 25th. For the first time in history, the SPEARS Southwest Tour Series and the NASCAR K&N Pro Series will compete on the same night at Irwindale. The event also has historic significance, as the K&N Series will stage two separate 100-lap events in the same night with the “NAPA Auto Parts Twin 100’s”. The schedule for this big night at Irwindale Speedway will start off with qualifying at 4:20pm, on-track autograph session at 6pm and the first 100 lapper for the NASCAR K&N Pro Series starting at 7pm, followed by the SPEARS Southwest Tour Series “SPEARS Manufacturing 100”, and finally the second 100-lap event for the K&N Series. The SPEARS Southwest Tour Series and the NASCAR K&N Pro Series West, together at Irwindale Speedway on Saturday, March 25th. Advance tickets are $15 at www.Irwindalespeedway.com, $20 at the gate on Race Day. Children 5 and under are free. Spectator gates open at 4pm.